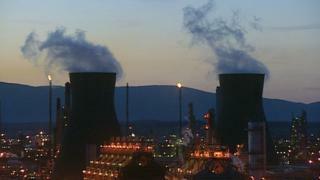 Q&A: Grangemouth - What now? Owners Ineos have announced that the petrochemical plant at the giant Grangemouth complex in central Scotland is to close. The neighbouring refinery will remain open. About 800 people are directly employed by the petrochemical plant, with more employed as sub-contractors. Union leaders have now said they are prepared to make concessions to try to save the petrochemical plant and are due to meet company managers. What's the problem with the petro-chemical plant at Grangemouth? Grangemouth's petro-chemical plant has used the by-products from refining oil across the road at the refinery. That's been used to manufacture a wide range of products, including plastics and pharmaceuticals. The oil coming down the pipeline from the Forties network in the North Sea has less of the ethane content, meaning the petro-chemical plant has been operating at less than 60% of capacity. To source new gas 'feedstock', Ineos planned to import it from the US, where the shale gas boom has driven down prices. It said earlier this month that its 'survival plan' would require more than £300m of Ineos investment to re-equip the Forth Valley plant. The firm also said it would require government loan guarantees and big cuts in costs, primarily the pay and pensions of the refinery and petro-chemical plants' joint workforce of 1,370. Without that agreement, it said the petro-chemical plant would close by 2017. How has this industrial dispute led to closure? Unite, the trade union, started industrial action 16 days ago over a separate dispute involving alleged victimisation. It then gave notice of a 48-hour strike from Sunday to Tuesday. Management responded by shutting down the plant. There were talks last week at arbitration service Acas. They broke down, but the union withdrew its strike threat. Ineos moved swiftly to require staff to accept changes to their contracts. The union urged members not to accept but to demand a return to negotiations. Two-thirds of Unite members took that advice, or half of the total workforce. Ineos said on Wednesday morning that the union response led it to close the plant, much faster than it had previously indicated. Liquidators are to be appointed within a week. Could it have a future? There may still be value to the assets, though Ineos recently reduced its asset valuation from nearly £400m to zero, saying there is no realistic prospect of future profit. A liquidator could seek a buyer. What that buyer would require is necessary funds for re-equipping it. It would have to source the feedstock, probably from the USA. If Ineos figures are correct, it would also require a lower cost base, so similar problems of reduced pay and pensions could arise, without industrial relations tensions being resolved. The Scottish government has become involved in trying to find a buyer for Grangemouth, ahead of the decision on petro-chemical closure. It hasn't ruled out the possibility of taking over the plant itself. Neither ministers nor the civil service have expertise in running a complex petro-chemical plant, and would have to appoint an operator, and pay for it. It would also have to find funds for investment, when its capital budget is already severely squeezed. If Ineos's figures are correct, the Scottish government would face losses for the foreseeable future. It would also have to address the industrial relations challenge. What future for the refinery? The finances of the neighbouring refinery have been helped by selling feedstock to the petro-chemical plant. Without that outlet for its by-product, it will have to flare off excess gas, losing income and raising issues about excessive emissions. It could seek to ship out its by-products, but transportation would raise costs, and would be in competition with American shipments. On them, Ineos says gas is available at quarter of the European price. Jim Ratcliffe, the boss of Ineos, has warned that if the petro-chemical plant closes, then it is likely to lead to the demise of the refinery as well. The refinery market is suffering from significant global over-capacity, with more new refineries being built in the Middle East and Asia. They are more efficient and better suited to modern demand patterns for diesel instead of the high petrol output for which older European refineries were designed. There have been several recent refinery closures across Europe, where owners have been unable to find buyers. The big oil producers have been exiting the market for both refining and petro-chemicals over recent years, because they get better return on their capital from focussing on upstream exploration and production. However, state-controlled PetroChina has made colossal losses on its refining in recent years, and its management are focussed on handling a major corruption scandal in China.